Major General Patrick Marriott has held a number of high profile positions within the British Army including Colonel of the Queen’s Royal Lancers, Chief of Staff, HQ 1 (UK) Armoured Division, Commander of the 7th Armoured Brigade, Assistant Chief of Staff (Operations) at Permanent Joint Headquarters and Commandant of the Royal Military Academy. Major General Marriott was commissioned from Sandhurst into the 17th/21st Lancers in 1977. His early career included service in the UK, Norway, Germany, and as a border base commander with the Royal Green Jackets, in Northern Ireland. In 1982 he served on operations in Israel and Egypt with the Multinational Force and Observers. He then became Assistant Military Assistant to the Vice Chief of the Defence Staff (Personnel and Logistics) and, latterly, to the Deputy Chief of the Defence Staff (Personnel and Programmes) in the MOD. In 1990, he attended the Canadian Forces Command and Staff College, Toronto, passing with distinction. Following two tours as an armoured squadron leader he was posted to the British Army Training Unit at Suffield in Canada responsible for all the safety and training of battle groups on the prairie. He left Canada on promotion in 1997 and joined the Joint Operations Centre at SHAPE, Belgium working on Balkans plans. He assumed command of The Queen’s Royal Lancers in 1998, deploying his battlegroup to Bosnia – for which he was subsequently made an OBE. In 2000 Major General Marriott was posted to the Permanent Joint Headquarters (PJHQ) in Northwood where he became the Operations Team Leader for all UK operations in the Balkans. In 2001 he became Chief of Staff (COS) in Headquarters 1st (UK) Armoured Division. His time there saw the division attack into Iraq on Op TELIC 1 for which he was made a CBE. He attended the Higher Command and Staff Course in 2005, becoming the Commander of 7th Armoured Brigade (The Desert Rats) in the same year. The Brigade deployed to Iraq in 2005/6, a gritty tour, for which Major General Marriott was awarded a QCVS. Major General Marriott was then, for two years, Assistant COS For operations at PJHQ, responsible for all the UK’s current overseas operations, including Iraq and Afghanistan. In 2009 he became Commandant at the Royal Military Academy Sandhurst from where he retired in 2012. At Sandhurst he was also DG for Leadership for the Army and was responsible for creating ‘Developing Leaders’, the Army’s current leadership doctrine. He was made a CB in the same year. 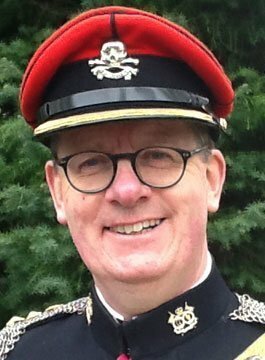 In 2015 Major General Marriott retired as Colonel of The Queen’s Royal Lancers. Leadership – focusing on Thinking, Competence, Judgement, Trust, Willpower, Service, Communications, Rightness, Learning and Devotion.